Wales' Paul Davies claimed a bronze medal in the table tennis on day five of the 2012 Paralympics in London. Davies, 45, of North Cornelly near Bridgend, beat South Korea's Chang Ho Lee 3-2 in the Class 1 category. Liz Johnson missed out on a medal at the Aquatics Centre in the SM6 200M individual medley. Newport-born Johnson, 26, finished sixth as Swansea-based Ellie Simmonds won her second gold with a world record of three minutes 5.39 seconds. Johnson will have a another opportunity for a medals when she defends her 100m breastroke title on Wednesday. 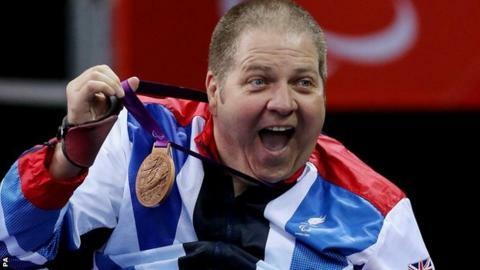 Davis has been working towards appearing at the Games since becoming more actively involved in table tennis in 1991, five years after he was paralysed in a motorbike accident. "I am over the moon to be a Paralympic bronze medallist," he said. "I've been playing for 21 years, since the day my son was born until today so it is a happy day. "I don't know what is going on with me lately. It keeps going to the fifth set. I have had a few big scraps and I treated this bronze medal match as my final match. "It was all to gain, all to work hard for and I am very happy to come away with a bronze medal in front of a home crowd. "All the psychology work I've done and all that experience came together great on the day. "It was a big scrap out there and I am not saying it was easy because it wasn't. Lee from Korea is a great player and big respect to him." One of Davies' fellow Welsh table tennis stars, Sara Head also had a chance of table tennis bronze. But the 32-year-old from Beddau in south Wales lost 3-1 to the Slovakian Alena Kanova to finish fourth. Sailing Race 5&6: Stephen Thomas (Sonar) - 7th after 6 races.